Banning access to electronic devices has become a daily routine by parents for the intolerable behavior of their children. For kids at their teenage, it is even harder to put restrictions as they find endless possibilities for freeing them. Nowadays the only way to get children’s attention is to cut them off from their devices. The threat of having their phones confiscated seems like a hard blow by teens and the worst part for comes when the phones get searched by their parents. But most of the parents are oblivious that what actually goes in their kid’s brain when their mobile phones are taken. It has become irksome for most parents to see their child bending over the phone and missing out on their education. Phones appear as a threat to parents as their kids spend an unprecedented amount of time online that is off limits and is unsupervised by any means. But it never raised any questions in children’s mind that whatever their parents are doing is something not good for them. 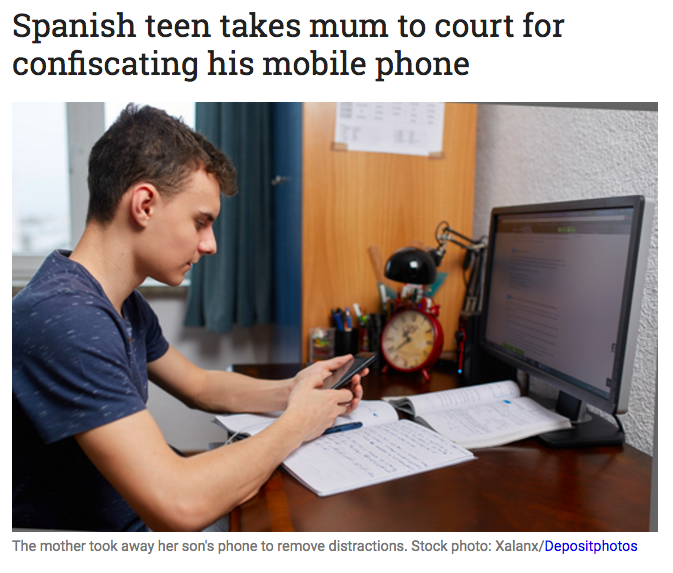 As recently an unnamed Spanish teen sued his mom after she confiscated his phone. This action by the teenager’s mother was totally within her limits. She as a guardian was responsible for her child’s education and it would have been unacceptable if she had allowed her son to stay engaged on his mobile. He would have failed in his studies due to ignoring his school work. As outlined by the Civil Code, parents are responsible for their children’s education and can bound them for studying without reaching any extremes. It is hard to guess that what struck the 15-year old teenager’s mind to grind his mom in court on just confiscation of the phone. It is unclear what actions will be taken by the court regarding the issue but this incident surely will create an uneasy situation for parents of all teenagers.